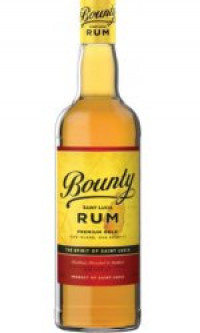 As St. Lucia’s most popular rum, the Bounty premium gold rum is famous for its wonderful light butterscotch aromas and candied fruit nose. The opening palate begins soft, with a rich raisin fruit and a hint of honey and vanilla spice from ageing. Medium bodied with ripe sultana fruit, vanilla from the oak and a hint of spice. Good balance, clean, and with an enjoyable finish. Rum Blend: 100% Coffey Column Still Rum, matured 2 years in ex-Bourbon casks.